There was a little pain, poor vision, and light sensitivity. I couldn’t wear the contact lenses that were the only way to correct my vision and had trouble finding a glaucoma treatment that my eye could tolerate. During this time, I had many appointments with various specialists, and tried a variety of topical medications and an oral one that made me ill. But now, a solution is in sight. Despite some last-minute delays, including one caused by the Blizzard of 2015, I just got a scleral lens for each eye. My lenses are new, so it’s too early to say for sure, but my eyes already feel better than they did with ordinary contacts or nothing at all. And I can see again. A scleral lens is a large contact lens that rests on the sclera, the white portion of the eye, rather than on the cornea. The lenses bulge outward, creating a tear-filled vault which protects the cornea and allows it to heal. You can see in the photo how it compares to the regular gas permeable (hard) contacts I had been using. 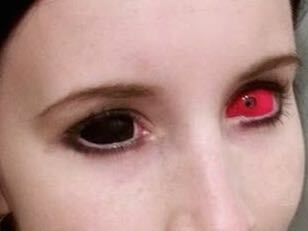 Prototype scleral lenses were made in the late 1800’s. 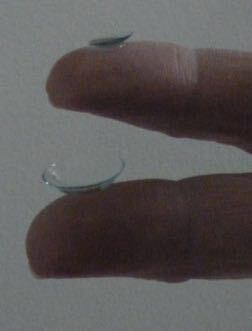 Lenses would be shaped to conform to a mold of the eye. But without oxygen permeability they weren’t very practical. The modern lenses are made possible by the development of a highly oxygen permeable polymer for the lens itself and digital imaging techniques (including optical coherence tomography) to record the shape of the eye’s surface. That information allows creation of a virtual 3D scleral lens design. Because the lenses are rigid and fluid-filled the correction can be better than with glasses or various kinds of contact lenses. That fluid, and the fact that the lenses don’t touch the cornea, means that they feel better and can help the cornea to heal. I’ll have to allow some time to see whether those promises hold true. There’s also some work involved in learning how to insert and remove the lenses. 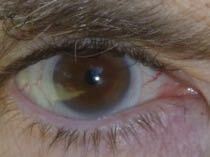 A scleral lens is not the same as a sclera lens (see left). Either might invite thoughts of extraterrestrials. (1) Keratoconus, glaucoma, dry eye, astigmatism, etc.